Tickets to get you in the air! Price of admission includes "flight school" training before your aerial adventure. Course features 3 levels from 15' to 50' and has over 60 challenge elements. Also access to ziplines and drop stations. *Note for children 10 and under: In order to navigate the course unattended, child must be able to reach 70" while standing flat-footed (See Diagram). If they cannot reach the child must be accompanied by an Adult or a Young Adult with sufficient reach. 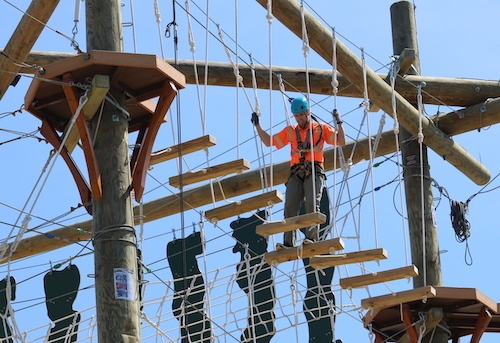 Typical participant covers up to half the obstacles and one zip tour. Typical participant covers most of the obstacles and two zip tours. Typical participant covers all the obstacles and three zip tours. Typical participant covers all obstacles & some multiple times and 4 plus zip tours. The Cadet's Course is all on the first level at 15 feet above the ground. Their are 10 different challenge elements on this course. 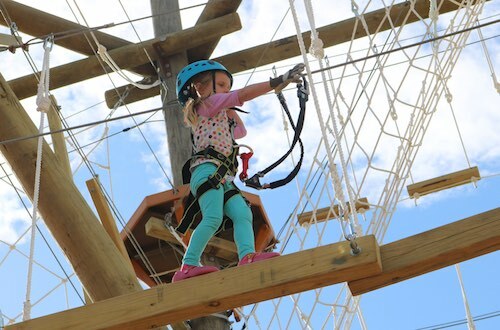 The Cadet's Course features a safety line that is lower and easy for younger children to reach. 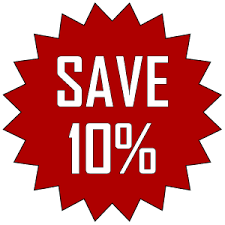 You can now Save 10% on General Admission Tickets which are the products listed on this page when you book 5 or more days in advance. Simply enter the promo code "EarlyBird" in checkout when you have selected a reservation date at least 5 days in advance! We are generally open rain or shine on the dates specefied on our online calendar. The exceptions that we reserve the right to close for include, wind storm, lightning, or simply because the weather forecast is poor and there are no advanced bookings for that time. If you book in advance, we will be open for you unless we communicate with you directly to reschedule. Please arrive 30 minutes prior to your climb time to allow for office check-in, gear up and training. Walk-ins are always welcome, space permitting. That said, we highly recommend booking an online reservation so we can plan for your visit and staff appropriately. Doing this will also make for a smooth check-in process so you can begin your experience without delay and is very much appreciated. Do you want to know if we have space available? Just begin booking your preferred ticket with a date and time and the number in green will show you how many harnesses are available for that time slot. In order to determine whether your child will be able to navigate the Captain's course on their own, you will want to measure their standing reach. This is the distance from the ground to their finger tips when they are standing on the ground flat footed. You will want to measure the child with shoes on because they are required to wear shoes on the course. The minimum reach height is 70" for a participant to climb unassisted. We do offer climing assistance below, but you will need to call to schedule assistance so we can make sure we have enough staff available for your needs. Would you like additional help going through the course? We now offer a personal guide (extra fee and reservations required). Available for adults or children. The guide can assist up to 3 individuals. 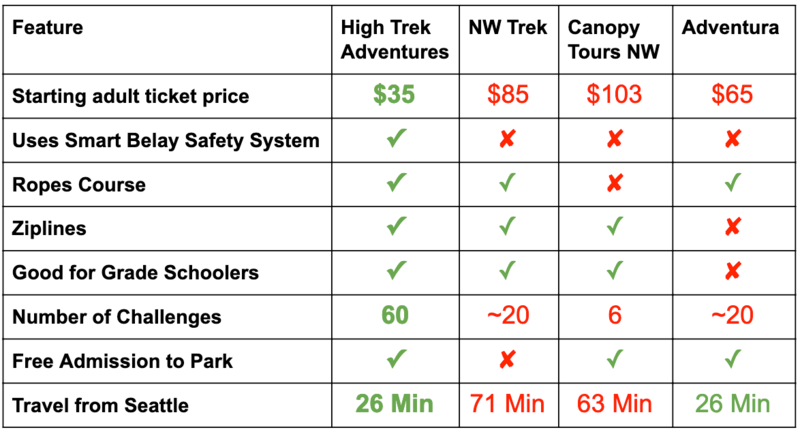 Ascend into our course with our highly trained High Trek staff. Purchasing the help of a guide will grant the participants 1 hour of time up in our ropes course and the zipline with a High Trek guide.